One Day in Brooklyn, Jacob Fred Jazz Odyssey's first disc with newest recruit Chris Combs, was a stunning set of one-take wonders -- emphasis on "wonders," since that kind of consistent brilliance rarely happens right out of the box, even if all you're playing is cover tunes. Stay Gold is what happens when a group this good takes a little time, and the new guy brings his own stuff to the table. Combs announces his presence immediately on "The Sensation of Seeing Light," which he co-wrote with keyboardist Brian Haas: Combs' lap steel sings mournful, echoing notes over Haas' piano fills and the rhythm section's foundation figure. Combs moves closer to the front as bassist Matt Hayes and drummer Josh Raymer cranks up the groove under Haas' peerless counter. "Sensation" is a good trip that only gets better when Haas' lines get more operatic and Combs' fills go completely mental. The ride is over relatively quickly, but then rollercoasters do their thing in less time, and they're not as exciting. Even though every piece on Gold gets wrapped around some kind of groove, JFJO eschews the tried-it's-true, solo-centric Jam Band framework in favor of joining forces to tell one story -- or paint one scene -- with each piece; the story may be complex as hell, and the scene may have a ton of elements, but the experience is a lot richer than just listening to musicians get their individual ya-ya's out: Haas' "Trampoline Phoenix" communicates the childhood fun of bouncing up and down with your friends, becoming darker when "the big kids" get in on the action; Raymer's "Song for Lauren" is a beautiful dobro-laced trip through the country with the one you love; and Hayes' bluesy waltz "This, Our Home" offers up a safe place from the tumult that is the everyday. Combs' exemplary guitar work helps Haas' personal direction-change from Fender Rhodes to acoustic piano, and provides the effects that disappear with the Rhodes' minimization. This move doesn't lessen Haas' creative scope -- if anything, Combs' addition as foil and second solo voice sends Haas further out into space, which is a beautiful thing for anyone familiar with Jacob Fred's electrifying dynamic. 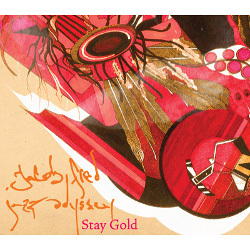 Stay Gold is another move from a band that's constantly evolving, and as always, this iteration is a little better than the last one.